Fortid originally hail from Iceland. They were formed as one-man outfit in 2002 by Einar Thorberg Guðmundsson ‘Eldur’ (think: Potentiam, Curse, Thule, and recently also in Den Saakaldte or Midnattsvrede). In the first place, Eldur wanted to create a trilogy based on / inspired by the Völuspá-saga (known from the Ásatrú-literature), and in 2003 he released its first part, called Völuspá Part I: Thor’s Anger. Because of his activities in other bands, it took quite some time, but the second chapter was released in 2007 under the title of Völuspá Part II: The Arrival Of Fenris. Then Eldur decided to move over to Norway, and with assistance of some colleagues, he finished the third part of this triptych in 2010 (Völuspá Part III: Fall Of The Ages; which was the first for Schwarzdorn Production, by the way). Fortid having evolved into a ‘band’ now, started playing live all over European soil. 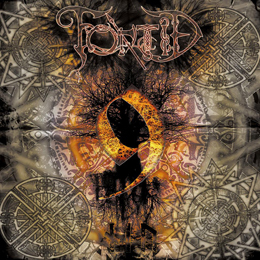 The line-up grew into comfortable dimensions, and for the first time as a group, Fortid wrote and recorded a new album, being Pagan Prophecies, accompanying the band into a new era. Just like the former album, 9 did progress in comparison to the trilogy. Fortid sounds much more progressive now, and (little) more catchy and accessible. Still there’s some of the epic and magisterial Viking attitude of Old, evidently, with a comparable obscure, mystic sound aka the earliest efforts. Especially within the most blackish parts, that victorious spirit comes forth in each single aspect. And once again the Norwegian scene especially comes to mind. But the progression is remarkable, and it needs notification of the listener. But it’s the Borknagar-trend you’ll undergo right now rather than the Taake-oriented approach (or something like this). I have to admit that I am more into their old approach, but one cannot deny the excellence of both song writing and performance. The average duration of each composition is pretty lengthy, yet it remains ingeniously constructed. You do not need to be ‘into’ more technical-oriented upsets to like this material, for the elegance of precision and craftsmanship are performed from a high standard level for sure.